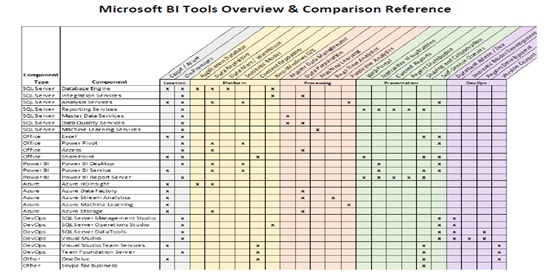 Microsoft offers more than 20 tools in its BI and data warehouse ecosystem. If your organization uses the Microsoft platform to build its business intelligence and data warehouse solutions, understanding these assets and uses for each will help you to build an efficient, integrated BI solution. Download this handy matrix as a quick reference of the uses for all Microsoft BI and DW products including: Power BI, SQL Server, Office, SharePoint, Azure. You may also want to listen to our webinar recording Power BI: Beyond the Buzz where we give you the Straight talk on Microsoft's Data Visualization Tool for BI.